Ricky Gonzalez is creating quite a stir on the Northern California circuit. 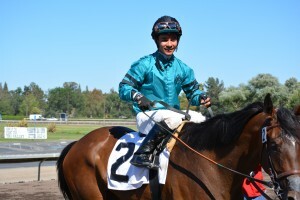 After just over three years of riding in the USA he has already ridden close to 500 winners that have earned over $8 million in purses. We talked to Ricky about the successful start he has made and how he got into racing. TBP: Ricky you’ve had a great start to your riding career, tell us how it started. RG: I started riding in Mexico City at Hipódromo de las Américas. I never sat on a horse until I was 14 or 15, I got interested after watching the TV show “Jockeys” on the Animal Planet station which we had down in Mexico. My Dad’s uncle who was a breeder in Mexico introduced me to Carlos Silva, he got me going down there. I started galloping and then working horses for him. I stayed around four or five months and I rode my first race there in Mexico City. It was a night meeting with a huge crowd and I ran fourth. Then I came to the US to Phoenix and Turf Paradise. I got my jockey’s licence pretty much right away. I didn’t speak any English at the time when I arrived, I was worried as I hadn’t realized how many Spanish speaking people worked at the track, but I started taking English lessons straight away and now my English is pretty good. TBP: How long did it take you to get going when you arrived? RG: I won a race on a pick up mount the week after I got to Phoenix on a horse called What A Laser. It was fantastic to get off the mark so fast. I was claiming ten pounds then, but I got to five wins pretty quickly so I was then down to claiming seven. I stayed around three months and then I went to Belmont Park, New York. Angel Cordero was going to help me get started there, but I had problems with the visa process in New York state and I couldn’t get my licence, so I came back to Northern California when the Pleasanton meet was on last year. 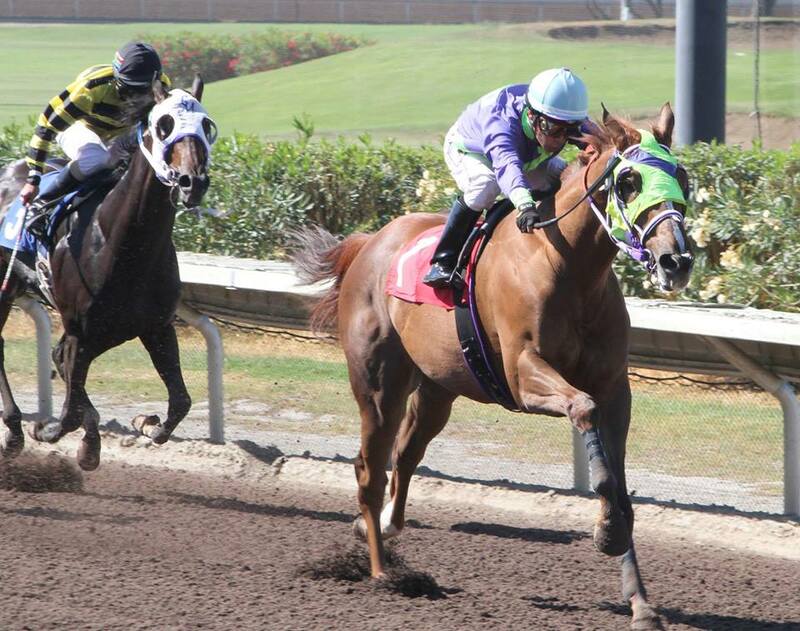 A trainer from Phoenix put me on some horses, then my new agent Ron Freitas started getting me plenty of rides. TBP: What do you enjoy most about riding races? RG: Well I love horses and I also love the adrenalin rush of riding, it’s amazing. You just want more and more. TBP: How do you find riding on the synthetic track at Golden Gate after you had started out on dirt tracks in Mexico City and at Turf Paradise and Pleasanton here in the US? RG: Actually it was tricky to get used to, the first time I worked a horse on the Tapeta I went way too slow, I worked a horse for Bill Delia and I just ended up galloping really rather than working so it caught me out the first time, but then I got used to it and adapted. It’s nice to ride on because there is no kick back. TBP: Who has helped you the most here in the US in the past year or so since you started? RG: Well my agent of course and also Leslie Mawing who also had Ron as an agent, he helped me a lot. Leslie has gone to ride up in Washington now, but when he was here I shared an apartment with him and we would watch the replays of my races together and he’d coach me and give me advice about what I could have done and what I might try next time, he was a really big help to me. Also I am much better with the stick using both hands now, before I had trouble with my left hand and switching hands, but it comes fairly naturally now. TBP: Have you ridden in Southern California yet? RA: Yes I had a ride at Hollywood Park on a two year old filly called E Equalsmcsquared for Eric Kruljac. She was a really nice filly and it was nice to experience Hollywood Park before it closed. TBP: Who have been some of your favorite horses that you have ridden so far? 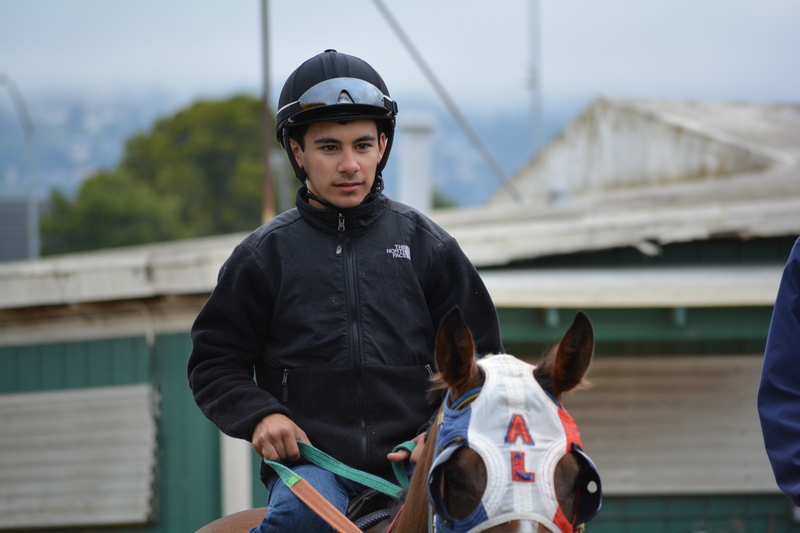 RG: Power of Ten is one of my favorites, Lloyd Mason trains her here at Golden Gate. She’s an allowance filly, I like her a lot, she has a big personality, she’s kind of crazy in the mornings and really tough to gallop but in the afternoon she tries hard all the way every time and is really tough. Another good filly that I really liked was Chati’s On Top that I rode for Bill Delia before she moved down south. And there is a horse called Dr. Williams who I won three straight on for Bill Morey. He is a really clever horse, a hard trier too, he puts himself in the right spot every time, he helps you and says “tell me where you want to go” and when you ask him he just goes, it’s like he knows where the wire is. TBP: Most satisfying day’s racing so far? RG: That has to be when I rode three winners in a day in November of last year at Golden Gate. I had a fourth ride on the day and I was thinking maybe I can ride another winner but it wasn’t to be as when the gate opened my horse stumbled and that was his chance gone. 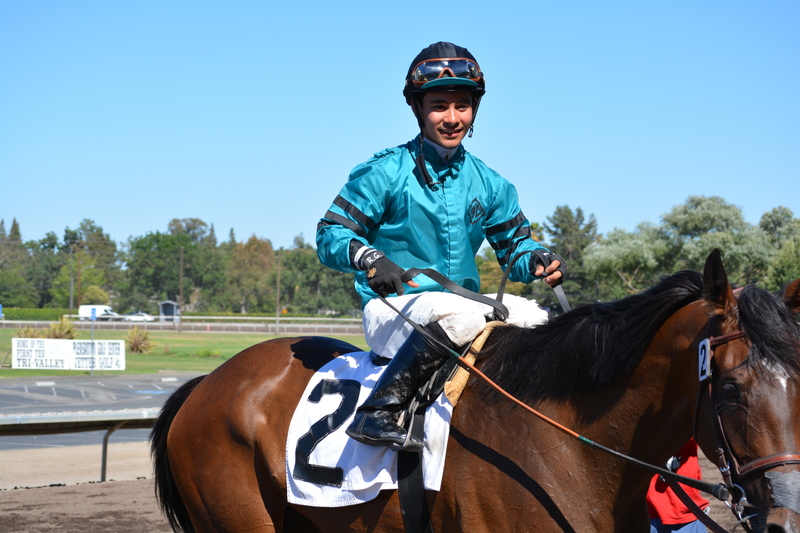 Also I won the $100,000 Oaktree Distaff stakes at Pleasanton recently on Tribal Gal who was a longshot on the day, that was my biggest win so far and it was a great day. TBP: What would you say is the best decision you have made in your career to date? RG: Definitely coming here to Golden Gate Fields. When I was thinking about coming here some people were telling me it wasn’t a good move, saying there weren’t many horses here and all the best rides go to Russell Baze. Once I got here though I fell in love with it, I love it round here. Russell can’t win all the races! TBP: I watched you in a head and head duel with Russell all the way down the stretch at Pleasanton recently and you won in the final strides after a close battle with the top rider, did he say anything to you afterwards? RG: Yes, he looked across at me as we were galloping out and said “congratulations.” He’s a classy guy, still very strong and very fit, I don’t know how he does it. TBP: Which other riders do you look out for here? RG: Dennis Carr and Frank Alvarado, when either of those guys are close to you at the head of the stretch you know they’ve usually got plenty of horse and they are coming after you. TBP: And which riders from across the country do you like to watch? RG: Joel Rosario for one, I love the way he rides, and John Velasquez, they are the two riders I would like to learn from. TBP: What are your goals for the next year or two? RG: Well I like it here, I don’t have any plans to move anywhere else at the moment. If opportunities come up I’ll see when the time comes. I just want to keep riding winners and doing a good job. This entry was posted on Tuesday, July 1st, 2014 at 4:13 pm and is filed under The Interviews. You can follow any responses to this entry through the RSS 2.0 feed. You can leave a response, or trackback from your own site.